I recently attended a Continuing Education Design webinar presented by Benjamin Moore Paint for Designers. Thought I’d share some of what I learned. It was about the Color forecast for fashion and design for 2013. Fasten your seat belts! They labeled the new style "intersection". Although it was a mixture of many styles, textures and colors, the main theme was taking things that had become useless and making them into “Cool”! These would be items that already had a history but may not be functional in today’s world. Revisit your past in your present! UK's Kingston University design student Lee Wei Chen realized that the skills he developed playing a lot of video games are practically useless in real life, so he set out to do something about it. 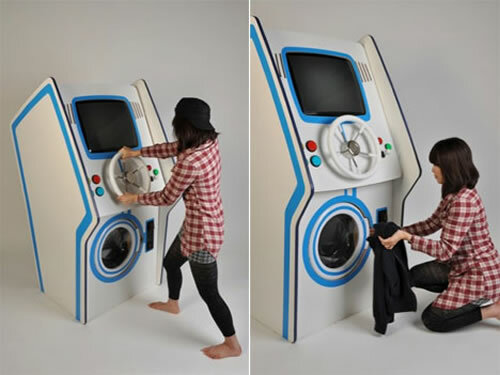 The machine looks like an arcade style video console – but the bottom half of the unit is a washing machine, with the components’ circuitry linked together. Therefore, the washing cycle is dependent on the success of the person playing the game, meaning that if they struggle, extra coins are needed to make sure the washing cycle is completed. Despite the genius behind the idea, it seems Chen is still far from becoming a domestic god, remaining blissfully unaware of the nuances of actually washing clothes. ‘I don’t even know how to choose the programme,’ he says.